* THE MURDER OF RONDA MAYOR Mariano Blanco III, killed inside the municipal hall of the Cebu town last September, and the ambush killing of his nephew, Vice Mayor Jonah John Ungab, in February of the same year might be taken out of the cold-case files yet. A Senate committee headed by Senator Ping Lacson is scheduled to look into the killings of elected officials -- placed at 12 mayors, seven vice mayors and one congressman -- since President Duterte assumed office on June 30, 2016. Investigators on the Blanco-Ungab cases have not yet published any progress report since the violent incidents occurred. Linked to drugs, the officials, with their surviving relatives, have not been given the "justice due them under the law." Cebu City Mayor Tomas Osmeña says he told a foreign journalist who asked why there is no Chinatown in Cebu when all the major cities of the world have one each: "Cebu has no Chinatown because Cebu is Chinatown. We are also Muslimtown, Koreatown, Eurotown, and everything else." Tomas said the Chinese have always been welcome in Cebu, they have chosen Cebu as their home, it being the center of trade in the region, and they have "integrated themselves into the community" and are now "an inseparable part of our culture." Then governor Lito Osmeña, who first publicly described the entire Cebu as a Chinatown, was a bit hyperbolic, less diplomatic to the other foreign nationals in Cebu, and more blunt. The Chinese here saw no need to cluster themselves in a specific area as they didn't see themselves as a minority that needed protection. The wealth and influence of many Chinese, which most other foreigners don't have, was enough shield against oppression. 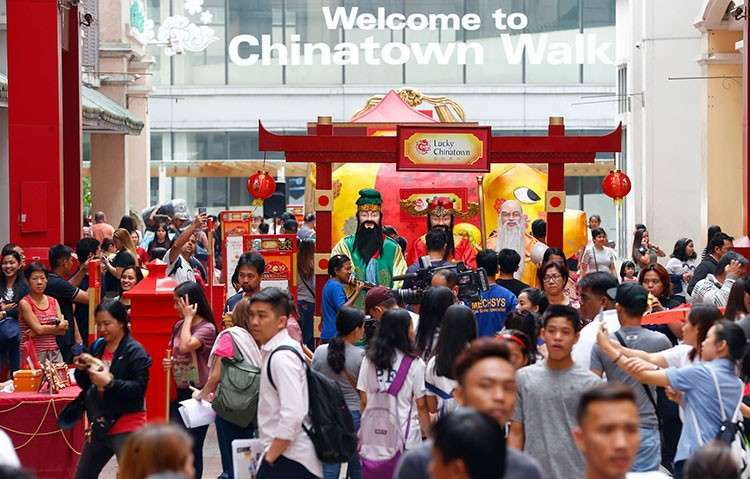 Nine months or so ago, Councilor Jerry Guardo proposed to put up a Chinatown in downtown Cebu City as tourism showcase for goods and culture of Chinese nationals and Chinese-Filipinos. Not much has been heard about it since Guardo filed his ordinance. There can be one if local leaders decide to adopt the Guardo proposal. But then if that happens, can they still brag about the whole of Cebu being a Chinatown? Bong Go, President Duterte's former "go-for" and master photo-bomber, for the first time barges into the upper half of the Magic 12 "senatoriables." In the January 23-26 commissioned survey of Social Weather Stations released at weekend, Bong Go rose to #5, tied with Sonny Angara at #6, both with 41 percent. No mean feat. He bested other Senate timbers that are seen to be stronger material such as Nancy Binay, 39 percent, #7; Mar Roxas and Bong Revilla, both with 38 percent, #8 and #9; Koko Pimentel, 36 percent #10; Bam Aquino, 33 percent and #11; and Jinggoy Estrada, 31 percent and #12. Grace Poe and Cynthia Villar kept their lead as #1 and #2 with 64 percent and 57 percent voter preference. Cebu's Sergio Osmeña III, who in the previous survey placed #13, is dislodged from that spot by "Bato" de la Rosa, with 29 percent and #13, and Imee Marcos, with 28 percent and #14. Serge with Revilla, Jinggoy and Mar Roxas, each received ratings in the past four Pulse Asia surveys of at least 25 percent. Would the former PNP chief's rating improve with his bio film that's scheduled for showing before the end of February? Maybe. Or maybe not, with the criticism of its clear propaganda motive and its having obtained a 100 percent exemption on amusement taxes, a suspected result of influence-pushing. As to Imee Marcos, her aggressive campaigning is making some headway but she's not yet out of the woods. * Those who accept the polling results but slam Bong Go's "inordinate" spending, questioning the source of funds. Should Go keep his spot, in the upper half of the Magic 12, he could win a Senate seat, assuming the surveys are not rigged to get him in. From "go-for" to senator: from a non-celebrity without having any experience in legislation to the Senate hall. But then some other senators earned their seats the same way: as movie entertainer or sports celebrity or because of family wealth or name. Or maybe not the same way. Bong Go is someone close to Duterte, literally and figuratively. He managed to gain power by his proximity to power -- and by photo-bombing in almost every photo taken of the president.